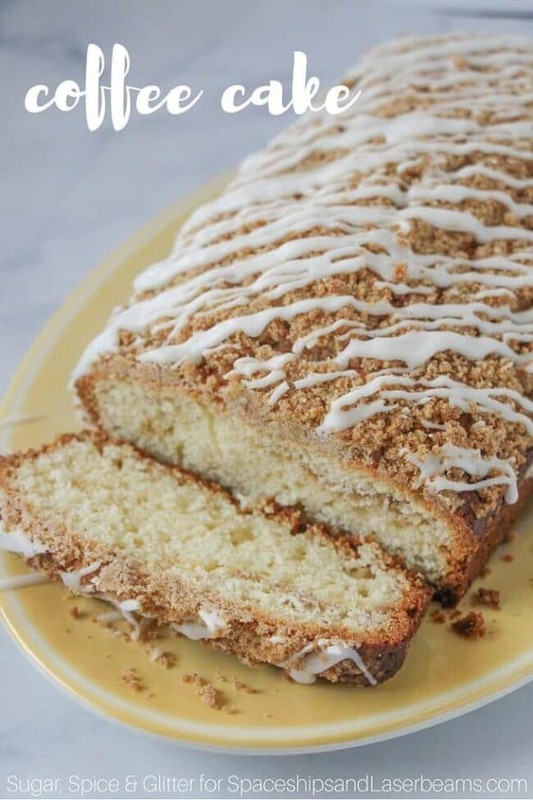 Whether it’s for quick breakfast or a brunch, coffee cake is perfect for anytime. This particular coffee cake recipe is incredibly moist without being too crumbly or soft. 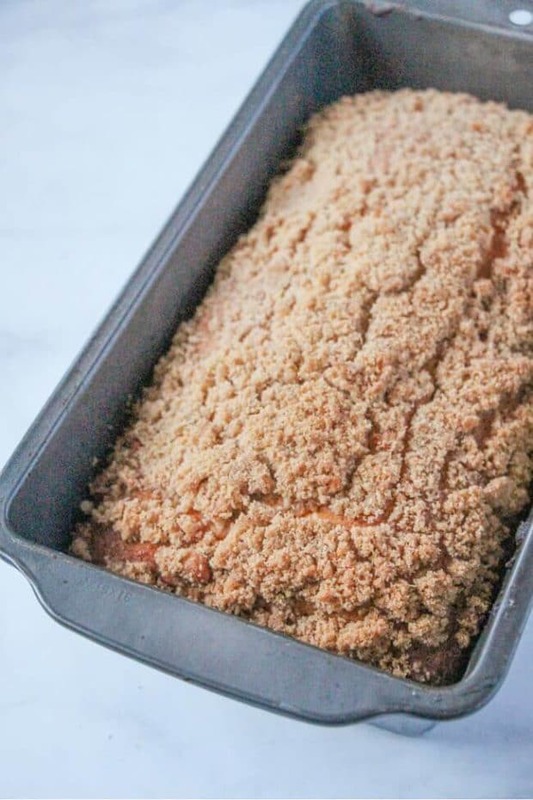 Its delicious brown sugar-cinnamon crumble and vanilla drizzle are essential for any coffee cake (at least in my kitchen) and they couldn’t be easier to make. If you’re looking for more delicious quick breads, make sure you try our chocolate zucchini bread and our lemon poppyseed cake. Because “coffee” is in the name “coffee cake”, the cake must have coffee in the ingredients, right? Actually, coffee cakes don’t have coffee in it at all. They’re usually a sweet cake with a mix of cinnamon-y sugar crumbs on top. Why is it called a coffee cake? Despite all the confusion over whether or not coffee cake has coffee, the reason it’s called coffee cake is actually deceptively simple. 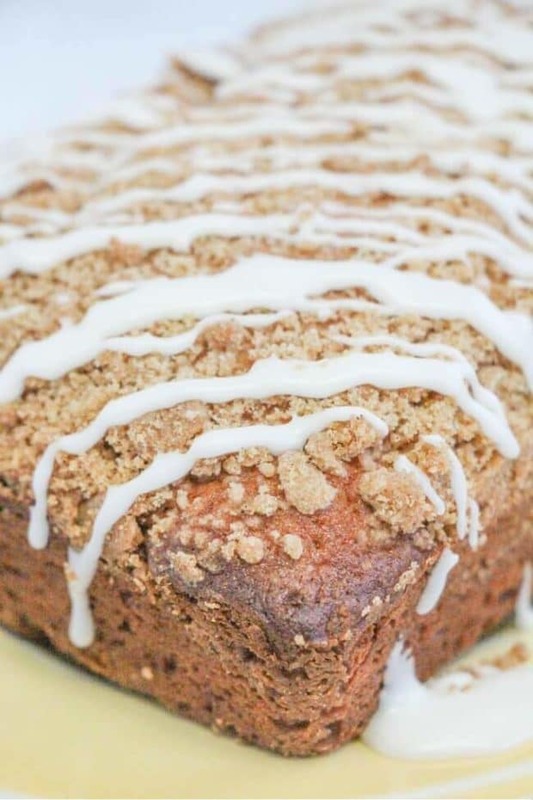 A coffee cake is called that because it is simply a cake to go with your cup of coffee. Typically, a coffee cake is a soft, moist cake that tastes buttery and light. The streusel in the middle and/or on top gives it a delightful addition of spices and sweetness as well the light crunch of the topping. With a drizzle of vanilla icing, this cake simply tastes like…well, afternoon coffee time heaven. First, set the oven to 350F for preheating. Grab a large bowl and combine 2 cups of flour, the baking powder, and the baking soda until well blended and set this mix aside. In another large bowl, beat granulated sugar, softened butter, and vanilla together with a mixer until it is nice and fluffy. Add the eggs one at a time, making sure that you’re beating the mix together well every time you add in an egg. Add in the flour mix and the sour cream in little bits by alternating between the two while continuing to beat the mixture. In a third bowl, combine two tablespoons of flour, the cold butter, brown sugar, and cinnamon. Pour half of the cake batter into your cake pan. You can use either a loaf pan or a bundt pan, which is more traditional. Spoon about half of the cinnamon brown sugar crumble on top of the cake batter. Repeat this step for the second layer. Pour the rest of the cake batter into the pan and put in the rest of the crumble over it. Let your coffee cake bake for about 45 to 50 minutes. You can check if its ready by inserting a toothpick in the center and seeing if it comes out completely clean. If it does, cool the cakes in the pan for about 10 minutes. Slide a knife gently along the side of the pan to loosen and invert the cake onto a wire rack and remove the pan to let it finish cooling. How do you store coffee cake? Well, coffee cake is good at room temperature for up to 2 days. If you want to store it for longer, wrap up your loaf with foil or cling wrap so it doesn’t dry out. You can then leave it in the fridge for up to a week. 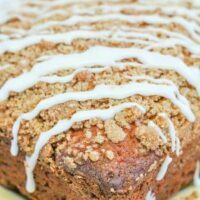 A coffee cake is so so amazing on its own already, but we also make a lovely icing we lightly drizzle over the loaf. It gives a gentle sweetness and a bit of extra moistness to your coffee cake. When the coffee cake has mostly or completely cooled, drizzle the sweet icing over the top with a piping bag or a spoon. I like just spooning them over because it fits the comfort food look of the coffee cake more. Make sure you check out our pumpkin banana bread if you want a caramel drizzle. We know the simple cinnamon version of coffee cake as it is, but what about any other variations? Truth be told, a coffee cake can really be whatever you make it. You can add any kinds of flavors or additions to coffee cakes. Chocolate chips or cream cheese are both amazing add-ins! For a fruity cake, I add anything from apples to banana. My favorite is an amazing combination of chocolate and raspberries, but blueberry is a close second. During the fall, I love to embrace the fall basics and make some pumpkin spice or apple coffee cake. Stop buying coffee cake at an overpriced coffee shop. Now that you have this recipe for homemade coffee cake, you can make the best from scratch, anytime. Beat granulated sugar, softened butter and vanilla in large bowl with mixer until light and fluffy. Add eggs, 1 at a time, beating well after each addition. Beat in flour mixture alternately with sour cream. In a separate bowl, combine 2 Tablespoons flour, cold butter, brown sugar and cinnamon. Pour half of the cake batter into a prepared pan - we used a loaf pan but a bundt pan for ease would be more traditional. Spoon half of the brown sugar-cinnamon crumble overtop of the cake batter, and then repeat. You will have two alternating layers of cake batter-crumble. Wait until the coffee cake has mostly cooled (or completely cooled) before drizzling overtop. You can use a piping bag or a spoon - I kind of think the imperfection is part of the charm in comfort foods like coffee cake, and fussing with a piping bag feels out of place with this recipe. This is the best to serve at brunch or for a snack… so yummy!